DeepH collects and analyses data about all of your daily activities and training. 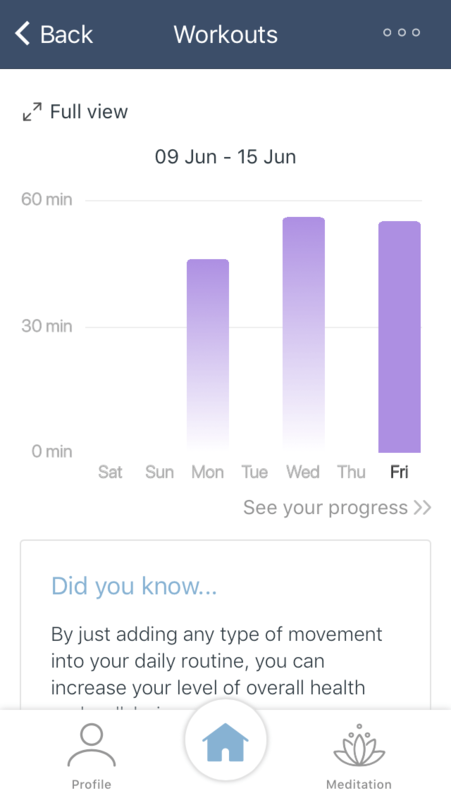 It shows the type and duration of the training, which is then stored and represented in your health profile. By following the ‘see your progress’ link you will be able to view the intensity level and duration of all of your training over last 7 days. By providing you with these analyses, the DeepH app will help you to understand which activity and which intensity is prevalent in your weekly regime. The DeepH app will also give you a clear picture of the activity type that your body is missing. Some people who perform low or moderate activities like yoga, walking or swimming might need more training with high intensity like cardio training to keep their hearts healthy. According to the World Health Organization, adults aged 18 – 64 should do at least one of the following: 150 minutes of moderate-intensity aerobic physical activity throughout the week 75 minutes of vigorous-intensity aerobic physical activity throughout the week an equivalent combination of moderate- and vigorous-intensity activity. Aerobic activity should be performed in sessions of at least 10 minutes duration. - Increase their moderate-intensity aerobic physical activity to 300 minutes per week. - Engage in 150 minutes of vigorous-intensity aerobic physical activity per week. - An equivalent combination of moderate- and vigorous-intensity activity. Muscle-strengthening activities involving major muscle groups should be done on 2 or more days a week. DeepH analyses the type, duration and intensity of your workouts and shows you your current status to help you understand what kind of activity would be more beneficial for you on weekly basis.